​AFSA has a long and solid history of advocating for Airmen, Veterans and their Families. You, the members of AFSA, are our history…men and women who have stepped up through the years to help your fellow Airmen and to be part of one powerful voice on Capitol Hill. That’s why we are proud to partner with Publishing Concepts Incorporated (PCI) to produce a 55th Anniversary Membership Directory titled Through the Years filled with your information and stories. This hard-cover book will contain basic directory information for all members who choose to participate, but you will also have the opportunity to archive your own history of service, or that of a loved one. Beginning the week of Oct. 12, 2015, PCI will contact members on behalf of AFSA via postcard and emails, then through follow-up phone calls, if needed. The representatives will verify the member information we have on file, to see if it’s correct or needs to be updated. When and where did you begin your military service or support if a family member? In which military campaigns did you participate? What was your most recent or final assignment? What is your fondest memory, or the greatest lesson learned? All of this is done at no cost to AFSA, and no cost to you, the member. The only thing that will cost you is if you choose to purchase a directory. We believe it will be a quality product worth the purchase price, but let me emphasize that you are not required to purchase anything! The representatives will offer for you to reserve an advanced copy of the book, which will be printed in July of 2016. Update our member records. We simply do not have the manpower within the association to reach out like this to all of our members. PCI will do that for us. Provide a quality product. The finished book will serve as a wonderful keepsake that documents our storied history as an association and as individuals. Provide revenue that allows us to continue to service our members. AFSA earns money on each book that is sold. This revenue will help us as we strive to keep membership dues reasonable while still providing members with the powerful voice on Capitol Hill and membership benefits that they have come to expect. If you have questions about the effort, please visit the AFSA website at www.hqafsa.org/through-the-years.html to see answers to Frequently Asked Questions. Thank you in advance for updating your information, and for purchasing the directory if you choose to. ​1. I received an email/postcard/phone call from a company asking for my personal information. They said they were working on a directory for AFSA. Is this a legitimate project, or is it a scam? We have partnered with PCI (also known as Publishing Concepts) to produce our new member directory. PCI is a company located in Dallas, Texas, that publishes directories for educational institutions, fraternities, sororities and military organizations across the nation. This project allows AFSA to receive important updates to our database so we know more about our members and how we can better serve you and future members. a. The names, addresses and information provided to PCI by AFSA for the publication of the Directory will be held confidential by PCI, except to the extent that they are utilized in, or in the preparation of, the Directory and except as required by court order or law. b. 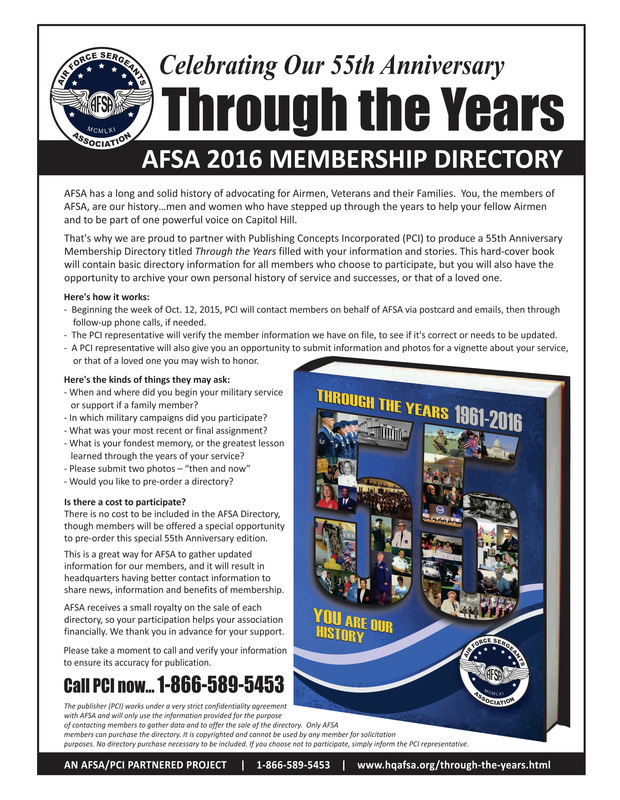 The Directory will be made available only to members of AFSA. Upon completion of the project, PCI will return to AFSA any and all electronic files that have been supplied by AFSA or produced by PCI in connection with the production of the Directory. If you have received a postcard or an email with a telephone number, you may call the number to speak with a dedicated representative for the AFSA project. The representative will verify all the information on file for you and make any updates where needed. One of the numbers for the AFSA members is 1-866-589-5453. If you have received an email with an embedded link, you may go to the online site to review your information. If you have questions, you may call PCI’s customer service desk at 1.800.982.1590. The AFSA members Directory is available for sale only to AFSA members. The total duration of the directory project is about 10 months. Since the project began in October 2015, the directories will be distributed in July 2016. 8. How do I upload my information and photos? You will receive an email with a link to upload your photos and narrative. If you do not have an email address,you will receive a letter with instructions on how to submit your photo. 9. Can I be featured in the directory without purchasing it? 10. Will the member stories be included in the electronic version? The electronic version is a USB Thumb Drive and it will have all the same information as the book, including the member stories. 11. May I order a USB Thumb Drive and a hard copy? Yes, there is a Value Package that offers both the hardbound book and USB Thumb Drive.